As many already know, Sol LeWitt (one of my very favorite artists) died yesterday. Michael Kimmelman's LeWitt obit in the NYT's says something about the man who would rather be about his work and Tyler Green has been keeping the flame as well. *Update Jerry Saltz does the best job though. Thankfully, there are many opportunities to see LeWitt's work in Portland too. There is a wide array of his print works on display at the Portland Art Museum for Jordan Schnitzer's Minimalism/Postminimalism prints show (it's gorgeous BTW). Also there is a really nice open cube (one of my favorite series of works ever, on display at the Jubitz Center. The Liz Leach Gallery already had a selection of his prints up before the sad news too. 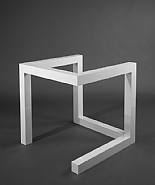 "Sol LeWitt brought to focus a process-driven abstraction with conceptual underpinning and installation sensibility. His work, minimalist and luxurious, collaborative and depersonalized, demonstrates the depths of abstract thinking as made real through the heights of public display. Helping execute LeWitt's WALL DRAWING #214 back in 1991 changed me as an artist. Many young artists worked on his projects. Many young artists were changed. This drawing was to be made of "unstraight" lines. As a highschooler, I felt I needed a little more direction and asked the artist to clarify what kind of "unstraight" line he had in mind. Was he thinking wildly frenetic or just plane wobbly? I chuckle thinking now of that situation. He gave me nothing. An "unstraight" line is an "unstraight" line. For me, it was a moment of tremendous possibility, the horizons of my life explained through the generous conceits of a master artist. I just posted a short little update on my website about his death. Simply put, I loved his work and it's a shame that we all have to die. Too bad all the bad ones just can't die quicker... yeah, that's right, I'm lookin' at you Kinkade. I had the priviledge to see the Sol Lewitt Retrospective at SFMOMA several years ago. Totally sublime. It was a crazy thing. There were times when I thought I was hallucinating or neurologically impaired because what he did was messing with my eyes so much. I was so blown away, but also had such a raging headache. Probably blew out some rods and cones that day.